I learnt a few valuable life lessons this weekend. The first is never to say anything bad about someone else in public- they could hear you! I was buying a copy of Emma Donoghue’s new book The Wonder, and I was LUCKILY talking about her kindly and how much I was looking forward to hearing her speak. “I hope you enjoy it” came a voice from behind me. I turned to see the shy smiling face of said Emma Donoghue. Could you imagine if I’d been saying we had trashed one of her books at my book club! (We haven’t). Then social faux pas number two nearly happened when my pal and I then proceeded to follow said Emma Donoghue to the lecture hall where she was speaking, and practically followed her onto the stage before we realised that we should actually be using the audience door. But the real lessons came from hearing her speak. As a busy mum of three, juggling jobs, it was a real bolster to hear her speak about the pressures of getting the writing done before the kids come out of school. She writes as a novelist, a screenwriter, and a journalist and fitting them all in, on top of family life is a challenge. She confessed that her children provide an inspiration to work hard wherever you are and not get precious about writing in a certain way. I’m the Martini girl of writing – I have trained myself to write any time, any place, anywhere. I’ve had to. But often when you hear of writers sitting at their desk for 9 hours a day, or writing all evening, I feel insecure about the way that my life forces me to write – when I can. So hearing Emma admit to the same was really encouraging. She talked about finding the nugget of a idea, and researching around it and letting it build until it becomes a full blown story. How dialogue drives her and that she has had to work on plot because she doesn’t find that comes easy to her. Again, encouraging to hear as someone who wrote her first book (still in the back of a drawer somewhere) with lovely writing and real chapters and everything but not a single thread of plot! It was good to hear that writers as good as her can still struggle with some aspects of the work. She talked about not letting genre or fear of being pigeonholed stop you from writing the way you want to write. That honesty is the best policy and to write what you feel. But most of all, it was learning what the feeling is you want to inspire in a reader. When Emma read from the first chapter of the book, everyone in the room groaned when she stopped. We wanted more. That’s how a book should make you feel. And when asked what inspired her, she said other writers, and other books. Just like she is inspiring many others. Your word count is high. ‘The End’ is written. And you may have even danced a little jig of celebration. You’ve signed off on the cover and you’ve finally, finally agreed on your blurb. You can take a deep breath and let it out again. Your work is done. Now the work continues. After possibly months (even years) of hiding away from humanity, locked away with only the tapping of keys to keep you company, it’s time to go public. The days are gone where your wrote The End, and waited for the publicity train to steam past, posting your creation to the top of the book shop shelf. Now, authors are expected to do as much publicity as possible, and work hard to promote their books. This can range from the obvious book launch, to events, readings, promotions and social media campaigns. Publishing is an extremely busy business, with a relentless roll out of new titles throughout the year. The UK, our neighbour and exporter to our shores of many authors, publishes more books per capita than any other country (nearly 200,000 per year), with every bookshelf spot competition for hundreds of books. And this doesn’t take into account self-published books. In the US for example, so many new titles are published that a book has less than a 1% chance of being stocked in an average bookstore. Consider also the fact that the average person reads between one and five books a year (I know most of us writers will be aghast at this, but apparently it’s true), and you can see why putting everything into publishing your book is as worthwhile as writing it. Also, it’s now expected. Publishing is a very costly business, and there are no ‘big marketing budgets’ out there unless you are JK Rowling or a very successful author with a track record. There is no other industry that produces so many new products, and each one requires investment in the writing, the editing, the copy editing, the cover, the design, the manufacture, the pricing, the selling, the marketing, the storing, the distributing. All of these costs have to be covered by sales. So increasingly the investment in marketing is limited, and the author needs to step up and deliver the audience as well as the words. If you are not a recognised author, with a back-log of successful books behind you, then the publisher is going to be looking at your ‘author platform’ along with your submission, to see how much you can contribute to the marketing process. This means, along with your work of art, what else can you bring to the table? As much as you can, is the answer. The book launch is an event really for you to get to wash your hair and hold up the book you have spent so long languishing over. It’s a chance to celebrate your achievement with friends, family and potential readers in a small and intimate way. It also means the book shop of your choice, if you choose to have it at one, will sell loads of your books in one night. But really, that is an internal event, and you have to be prepared to move externally. Finding an angle to your book is a good way to get newspaper and magazine articles written either about you or the book. Building your profile within the writing community also means you can write guest blog posts – do whole blog tours in fact, and ask the community to share and spread news about your book (as you will do for theirs). Building up that author profile is important and use it to promote, run competitions, share reviews. Events are a great way to get out there and build some profile, meet real readers. Social media is pretty much imperative these days, and being able to reach out to much wider audiences is crucial. Being an author is not just about writing. You have to be prepared to market and promote your book in as many ways as possible. To help give you a sense of what it means in ‘real life’ I asked 5 authors (including myself) to give advice on various aspects of publishing their books. As my book is non-fiction I have been able to create a lot of opportunities to write about the issues involved and get a number of large features in several Irish and UK magazines and national newspapers. I have also been able to talk on radio and TV about the issues and the book, and it helped establish myself as a voice on this subject. The issues continue to be relevant, and so the opportunities to write and promote my book as a result last much longer than the initial flurry around the book launch. I am already building that platform as the voice of a subject for a possible second non-fiction book. Making yourself available to as many publications, either by interview or by pitching and writing the articles yourself can give you access to an audience you just won’t get elsewhere. I made it a priority to accept and carry out every single opportunity for publicity, despite the publication of my book happening at a very challenging time personally for me. It is a very small window when the buzz around publication exists, so prioritising these chances are essential – they probably won’t come round again. 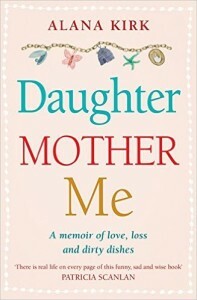 Alana Kirk is author of the best-seller Daughter, Mother, Me; A memoir of love, loss and dirty dishes. One of the reasons social media is important to authors is that every connection you make is a potential sale – just as it is in the real world. Don’t be shy about inviting people to your launch – invite everyone you know! Don’t rely on social media though – not everyone reads their messages on Facebook (I very rarely do!) or twitter. Be professional and create a graphic you can email or better still, post. Get business cards printed with your cover and contact details/link to your blog or website so people you meet randomly and start chatting to, can find you and your book again. Launch date – release/publication date isn’t necessarily the best date for your launch – you need to give the distributors time to get your book out to bookshops and their staff time to unpack them. If your PR/launch event happens too soon you could end up with frustrated readers looking for your book in shops where it hasn’t yet arrived! If you are planning a launch event in location special to you – I had one of my launches for Little Bones at the Royal St George Yacht Club in Dun Laoghaire, ask a bookseller to come and sell books for you – the fabulous Dubray Books came to do mine. It’s important that those sales go through a till what is linked to the Neilsen Book Scan or they won’t be recognised for the bestseller count. The bestseller lists are compiled on sales from Saturday at midnight to the following Saturday but are published a week in arrears (so your sales will be published the following week in the bestseller lists in the newspapers and Writing.ie) – if you are organising a series of events try and fit them all into one week! Don’t forget to nominate/organise a photographer (Ger Holland is amazing and does all the Writing.ie events including the Bord Gais Energy Book Awards) – you can use the photos in social media and a book launch is a bit like a wedding – you can’t remember who you’ve spoken to by the end so the photos will be useful! Make sure the bookshop/bookseller is included and they will be able to share too. Remember to come up with an original #hashtag for the event so you can increase shares and track back photos and comments on social media the next day. CHECK the # hasn’t been used by anyone else. Keep it short and easy to use (I personally think all books published today should have their #hashtag on the cover but that’s another discussion.) Booksellers are wonderful hard working people who love books, and the more information they have about your book in advance the better – your publisher will ensure that ARCs (Advance Reader Copies) are sent to bookshops so they can take a look at. Booksellers on the ground are incredibly helpful and if they are asked for help in choosing a book by a customer, as they often are, and they love yours, happy days! Pop into as many shops as you can to say hello and sign your books – readers prefer to buy signed books if they can so you are helping the bookseller and might win an extra sale! 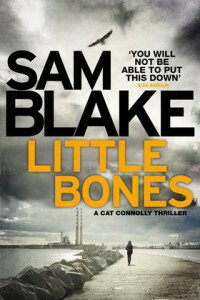 Sam Blake is the bestselling author of Little Bones that debuted in the bestseller list this May. Introducing fiesty young detective Cat Connolly, in the first of this thriller trilogy what appears to be a routine break-in has devastating consequences when Cat finds a baby’s bones concealed in the hem of a vintage wedding dress. Goodreads giveaways, competitions run through my author page on Facebook, and Bookbub promotions (all organised by my publisher) have been very helpful in reaching new readers, giving my books visibility and raising awareness of my backlist, as well as of new titles. Specific bookshop promotions such as Summer Reads, Buy One Get One Half Price and special promotions like WHSmith’s Fresh Talent and Easons Book of the Month can all really help a new book to stand out from the crowd. Supermarket promotions in the US have also had a real impact on my print sales. While these are all organised by the publisher, I have run a number of promotions myself on social media to garner some more activity around the book. I also keep my author blog and website up to date with any interesting book news (reviews, foreign translations, events I’m speaking at and awards) and any new information to keep the buzz going. I share that as widely as possible through social media. There is, however, a worry that you end up sharing constantly with the same people, so it’s really important to combine social media with face-to-face events such as writing festivals, conferences, book clubs, library and bookshop readings to broaden your audience base as much as possible. 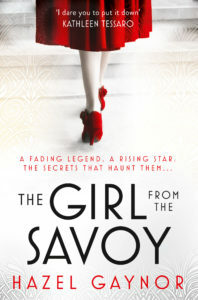 Hazel Gaynor is award winning author of the New York Best seller list The Girl Who Came Home, A Memory of Violets, and The Girl from the Savoy. Social media to me has been so beneficial, but probably not for the reason you think. Getting published is a bit of a weird experience, in that on one hand you’ve achieved your life-long dream and your biggest goal and now you get to work in your PJs, but on the other, it’s still a job and like all jobs, it has its ups and downs. There’s no point talking to friends or relatives about this, as every conversation would have to have a one-hour primer on all the ins and outs of the business before the real moaning/venting could begin. But I can easily talk about it with my writing friends, nearly all of whom I’ve met via Twitter or via someone I met via Twitter. So in that way, Twitter and Facebook has been vital to maintaining my mental health! In a more practical way, it’s called the publishing industry and writers are working in it. Therefore – just like any other professional – it’s a good idea to keep on top of what’s going on out there. Social media is great for that. Finally, we all know that authors with books to promote need a platform from which to do it. I remember once a small publisher hired me to do some social media for them, and when I asked them what they wanted, they said, ‘To use Twitter.’ But they had no Twitter account and neither did the author we were talking about. There’s a big difference between an author platform and an echo chamber. 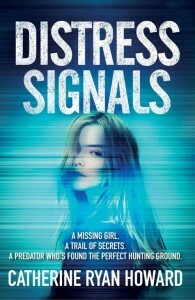 Catherine Ryan Howard is author of bestselling thriller Distress Signals. I see events as an essential part of being a writer – and especially if you’re writing for children and young adults. Not only does it balance out those long hours of sitting alone making up words and characters and stories, it also connects you with your audience. You’re helping to encourage a love of words, of books, of creativity – maybe you’ll even inspire a new generation of writers, or encourage young people to be brave enough to follow their dreams? And, on the flip side, the enthusiasm and interest is unbeatable – your readers will let you know their honest opinions and they’ll ask the best questions! On a business level, you also get paid for events so this helps to supplement the money you earn from royalties, and word of mouth is strong; you’d be surprised how far news of a great event will travel and the opportunities that can arise. But above all, it’s about meeting your audience, inspiring and being inspired, and creating a fun environment with storytelling at its heart. By the end of 2016, I’ll have done around 100 events this year, and that’s alongside completing and launching two more books. It’s an absolute joy. ER Murray is bestselling author of Caramel Hearts and the 9 Lives Trilogy, the first one of which, The Book of Learning, was the 2016 Dublin UNESCO City of Literature Citywide Read. 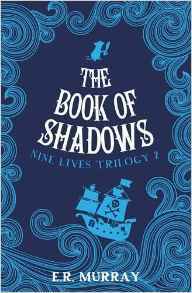 The Book of Shadows is out now.